The long and painful political and social transitions undergone in Timor-Leste have been documented from a variety of disciplinary perspectives and in many publications, especially in the years just preceding and immediately following independence from Indonesia (see, e.g., Aditjondro 1994; Kohen 1999; Taylor 1999). Some of these accounts have included references to the experiences of women. This publication – one of the few completely dedicated to women’s rights in the country – is valuable because it goes beyond providing information on and interpretations of gender relations in what used to be referred to as the ‘world’s newest nation’, to reach conclusions applicable to most countries in transition. The positives of the existence of powerful queens in pre-colonial and colonial Timor, and the roles of women in the war for independence and the progress in their political representation, are counterbalanced by the persistence of gender-based violence/violence against women, and of deep gender inequalities in education, nutritional status, health, land ownership, and earnings. This complex picture is well reflected in the different chapters in this edited collection, which generate insights into the unevenness of the gains and losses women experience in the journey towards full attainment of their rights. The Introduction outlines many of the book’s themes, though it could have been structured differently, namely by not giving such an early and prominent place to the concept of ‘gender’. 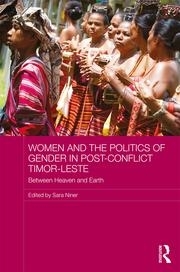 While the notion of ‘gender’ brings the long history covered in the book to the present day, introduced so early it risks reducing contents to the too simplistic point that ‘At the heart of the many challenges surrounding the pursuit of gender equality in Timor-Leste is the how the concept of gender is understood and interpreted (p. 1). The main lesson from the book is, on the contrary, one of complexity and contradiction, as the key institutions governing Timorese lives seem to hold great potential for promoting gender equality, while at the same time being implicated in increasing women’s vulnerability and depriving them of their rights. One of the chapters giving this kind of complex and thought-provoking analysis (‘Beyond the Timorese nationalistic orthodoxy: The “herstory” of Bi-Murak’, by Teresa Cunha), charts the short life of Bi-Murak, one of the heroines of the early liberation struggles. The memories of different actors are related, both to alert us of the ‘dangers of a single story’ (p. 61) and to forge a new interpretation of the recent history of the nation, and to replace the ‘virile and narcissistic idea of nation so proper to Western modern thinking’ (p. 56). (The need to rectify the focus on men in the country’s recent history is also made in one of the two concluding chapters, ‘Negotiating culture and gender expectations in Timor-Leste: ambiguities in post-colonial governance stragegies’, by Kelly Silva and Daniel Simião.) The accounts concerning Bi-Murak are moving and the analysis convincing, though at times – for example, on its treatment of motherhood – it is not entirely clear whether the argument supports or criticises conventional understanding of the roles attributed to women in conflict and nation building. Equally intriguing are the detailed descriptions of the existence of past queens in the ‘Lost queens of Timor’ by Hans Hägerdal and Douglas Kammen. These are interesting in themselves because almost totally lost from both formal historical and oral traditions, but more so because the recovery of such history helps us to understand, among other things, the need to challenge binary anthropological accounts (which attribute to men political power and to women ritual power) and to acknowledge that women’s status is always the outcome of constant negotiations, and linked to forces and events well beyond those at the local level. The chapter on the Catholic Church – ‘A gender perspective on the Catholic Church and reproductive health rights in Timor Leste’, by Esther Richards – echoes the idea of complexity and contradictions in its discussion of a Church that has deep roots and considerable popular appeal thanks to its syncretism with traditional spiritual beliefs and practices, but that is unlikely to support women’s rights, especially in matters of reproductive health and rights. The importance of the role of civil society in the country’s past and present is demonstrated in the chapter ‘The East Timorese Women’s Communication Forum: the development of Timor’s first women’s NGO’, which describes the evolution and achievements of women’s NGO, FOKUPERS. Several other articles refer to the organisation, thus providing a more rounded and diverse picture of women’s collective efforts in the country, and contributing to a body of knowledge on women’s rights organisations which remains scant. Throughout the collection, two themes are most recurrent, both as the focus of individual articles, and as passing but detailed references in many others: women’s political participation and violence against women (VAW). Consideration of women’s political participation brings to the fore another contradiction. The presence of women in the 2001 Constitutional Assembly and the gender quota agreed in the 2007 National Election Law are signs of the effectiveness of the women’s movement. However, these women are from the elite: activism by women’s movements has not led to non-elite women holding decision-making power, particularly in local-level institutions. This subject is dealt with in depth in the article on gender-responsive budgeting: ‘Budgetary policy, gender equality and the politics of change in Timor Leste’, by Monica Costa and Rhonda Sharp. This is where the contradictions are shown at their most acute: on the one hand, there is the success of women’s rights activists in ensuring budget allocations for the implementation of the Domestic Law and other gender-specific purposes (attributed here to activists working both within and outside the government and with representatives of international organisations) and, on the other, the threats to gender-responsive budgeting coming from poor service delivery, corruption, the reliance on petroleum revenues, and other factors. VAW is the other theme that repeatedly occurs throughout the book. In the chapter ‘East Timorese women challenge domestic violence’, by Nina Hall, VAW is the focus for testing theories of how international norms are negotiated on the ground, and thus changed. This chapter is more lively than others in the collection, and gives an unusually positive account of the role played by international actors in inspiring norms change through collaboration with national women’s organisations. Domestic violence is also the focus of an analysis of the benefits and dangers for women of formal legal instruments versus customary laws and structures in the article from the UN Development Programme, ‘Bikan no Kanuru – when plates and spoon make noise: domestic violence and customary law in Timor Leste’. This chapter’s conclusion is that customary laws offer much as part of broader strategies to respond to VAW, but safeguards must be put in place so that women’s individual rights are protected from customary laws’ tendency to prioritise communal harmony. In the treatment of both women’s political participation and violence in the book, ‘culture’ is seen as playing a central role, and is critically understood as a means, in both colonial and postcolonial contexts, for ‘managing power relations’ (p. 188). The concluding article, ‘Negotiating culture and gender expectations in Timor-Leste’, adopts this understanding, while retaining a notion of culture (with no quotation marks) as something relating to localised expectations, representations, and practices (p. 189). This contribution needs careful reading both because of the density of the argument (which still challenges my understanding) and as it may appear to negate widely accepted positions on gender equality. For example, in its discussion of culture as part of a ‘contemporary modernist project’, it defines the tactics adopted by some women’s rights activists, who present gender-based violence as contrary to (rather than part of) Timorese culture, as embracing such a project of modernisation while recognising it as a tool to circumvent male resistance to gender-progressive policies. Intriguing and thought-provoking as this is, the article could have been kinder to readers, and ended on a less unsettling account of the contradictory relationship between persistent gender inequalities and state building in Timor-Leste. Inevitably, there are some weaknesses and gaps in the collection. A more rounded concluding chapter could have offered ideas of what can be expected for the future of gender equality in Timor-Leste; and better copy-editing would have improved the quality of some of the chapters. The inclusion of work from Timorese authors would have added authenticity, and an exploration of how gender relations play out among women and men of the younger generation would have brought a new perspective. Despite its limitations, though, this interesting book creates a vivid and informed portrait of contemporary Timorese women’s lives as they have emerged through years of struggle. Gender norms and relations in the context of ‘fragile’ post-conflict settings is a relatively new area of enquiry, and the empirical evidence of different aspects of gender norms, practices, and policies in Timor-Leste will be of great value to both scholars and practitioners working in this field.